It is difficult to talk about the film without drawing upon meaningless superlatives. 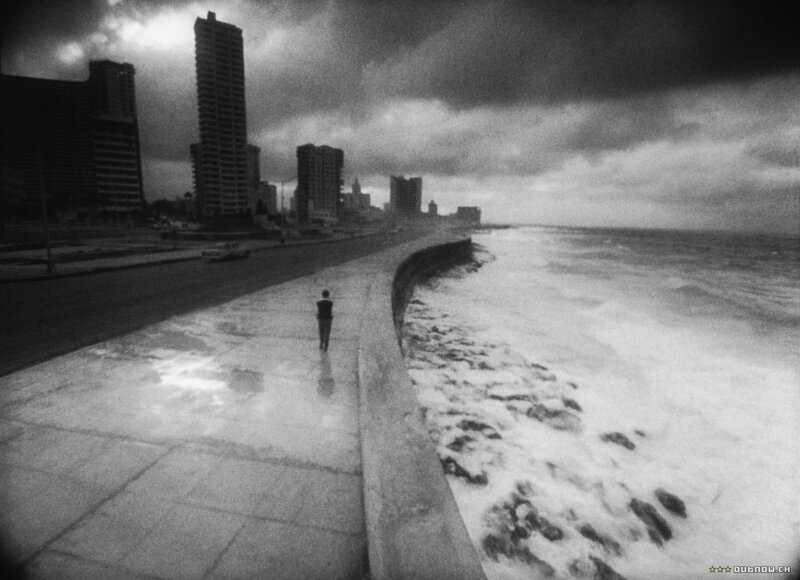 Let me say this much: the cinematography of I Am Cuba makes it seem as if every other film has been shot from within a locked birdcage, with only Kalatozov’s camera being fortunate enough to have found an open door. It swoops, climbs and detours like a frenzied budgerigar; but there is nothing haphazard about its trajectory. Every aspect of every ambitious shot, and there are many, suggests absolutely meticulous planning. It’s precisely the rigorously organised complexity of I Am Cuba‘s funeral procession scene, for example, that makes it one of the most famous single shots in cinematic history – not to mention the audacity that Kalatozov required in order to pull it off. In this sense, I Am Cuba is a work that simultaneously embodies freedom and control. If that’s a paradox, then so too are the film’s politics. The intentions of those commissioning the film seem clear enough: it was intended as a celebration of Cuba’s entry into the socialist pantheon, and as an act of cultural exchange between the Soviet Union and Fidel Castro’s new republic. Many Cuban viewers saw it, however, as less an act of exchange than one of imposition: to them, the Cuba they saw on the screen was nothing but a Soviet fantasy, bearing little relation to their country or their revolution. In the USSR, in turn, it was frowned upon for other reasons and quickly shelved; while in the West, it was dismissed by the few who even bothered to take notice of it as mere communist propaganda. Whether Kalatozov was being deliberately subversive is hard to say; but what seems clear is that the film’s moral messages are only ever given secondary importance to its form, an approach that was always bound to invite suspicion from party authorities. That I Am Cuba functions as propaganda ought not be a point of serious dispute. It is less apparent in the film’s first (and, in narrative terms, best) chapter, in which a Cuban prostitute at a bar takes an affluent American tourist back to her shanty town in order to complete the transaction. It’s not that this sequence isn’t political; indeed, it serves as a fierce critique of power imbalance and exploitation. But it remains a far cry from the bluntly militaristic final segment, in which a mountain-dwelling pacifist becomes radicalised, before dying a hero’s death on the battlefield. “You are not shooting to kill; you are firing at the past,” lies the narrator in that penultimate scene, over one of the most dishonest shots imaginable: the peasant soldier, marching in close profile with gun cocked, no falling bodies of enemy soldiers around to mar the frame. The sequence is a poem to bloodless, irreproachable bullets – the kind of bullets that always seem to have been fired in successful revolutions, once the dust has settled.